It's not just about living — it's about living well. 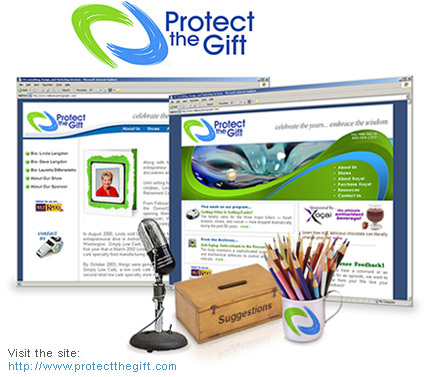 A weekly radio show on Portland, Oregon's 93.7 FM, Protect the Gift, celebrates life. They strive to demonstrate that we don't have to be in our twenties or thirties to truly enjoy each day, nor do we need to limit our vision. Their show features professional guests from diverse backgrounds who speak to their listeners about physical and emotional well-being, healthy lifestyles, and day-to-day issues that emerge as we grow older. Their goal is a commitment to continued learning. In creating their web presence, LNS worked hard to convey a feeling of peacefulness, of nature, and of their celebration of life. To symbolize the wisdom their audience embodies, we chose to use an antique pearl, perched upon wattery swirls. Their logo symbolizes both nature and an embrace, bringing together the final theme, "celebrate the years... embrace the wisdom."